A very cliched and predictable movie with the occasional brief laugh every now and again. 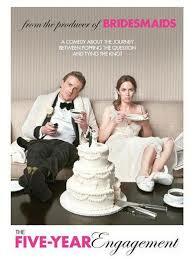 The Five Year Engagement is a very routine and unfunny movie. it’s about a couple that gets engaged at the start of the movie and then just doesn’t get married. Years and years go by and they still aren’t married yet. Does any of this sound funny? Interesting? Especially not when you consider that the reason why they don’t get married is because they keep moving cities in order for taking on new comitments with their jobs. At least if one of them was having an affair or something, there might be an interesting plot thread among the rest of it. Instead, we get a pretty lifeless movie. The one saving grace is that Jason Segal is one of the stars, and he is always at least a little funny. Segal wrote this movie, along with his Forgetting Sarah Marshal, cowriter, nick stoller, who also directed both movies. Unfortunately, this movie couldn’t be further away from everything that marshal was and stood for. The Five Year Engagement does have it’s moments, every now and again, but the story is at all times either dull or cliched, and there isn’t a whole lot of humor to help redeem it. The Five Year Engagement is a lousy movie. First off, it is exactly what you would expect and it really is exactly like every other movie. Let us start with the basic premise. A couple is engaged for years and never gets married. That is it. The reasons why they don’t get married are as standard and run of the mill as any you can think of… the girl, violet, has all kinds of job complications where she keeps needing to move from one city to another. That is it. I mean, at least give us that one of them is cheating on the other, or something even just a little bit juicy. This movie has none of it. What it does have is Jason Segal as the leading man and Nicholas Stoller as the director. That is a healthy combination. Stoller is the guy who directed Forgetting Sarah Marshal and Get Him to the Greek. Both were funny movies. In addition, he teamed up with Segal to write Sarah Marshal. Now the two of them teamed up to right five-year engagement together too. So, what went wrong? It is hard to believe that these movies are by the same people. The Five Year Engagement in no way feels like a Judd Apatow movie. Now apatow did produce it, just as if he produced every other Jason Segal or Jonah Hill movie, but this movie does not have the same flair for humor. It does not have that disregard of standards and blatant attempt at being simultaneously funny and gross, going for sexual jokes at every turn, that most Apatow movies have. From Knocked Up to Bridesmaids, his movies tend to at least be on the track (Ok, not all of them, there was that awful Adam Sandler movie, Funny People, but certainly the majority are.) somehow, the Five Year Engagement, though, feels much more like the usual standard crap. They might as well have starred Anna faris as the female lead for how clichéd this movie turned out to be. She is not in it, and Emily blunt takes her place, but faris’ husband, Chris Pratt (who is in most Anna Faris movies) is here, playing Tom (Jason Segal’s) best friend. He is the kind of actor who can usually help a little in a supporting role (like he did in Take Me Home Tonight,) only here he is given nothing. He’s got that one Billy Joel song, “We Didn’t Start The Fire,” scene that they show on all the previews, and even that isn’t all that funny. It wears out its welcome quickly. The main problem of the movie is that its premise is just so thin. A couple gets engaged and then finds reasons not to get married. None of them are very good ones. Do you think that somewhere in the third act of the movie they will go their separate ways and have a major fight or break up? I wonder. In addition, do you think they will get back together in the end? I wonder that one too. Everything about this movie is predictable. Now, to its credit, there are little jokes every now and again that are somewhat funny. None of it, by any means, makes this movie worthwhile, but if you have Jason Segal in a movie, the movie will definitely have at least a little humor in it. I like the scene where violet is with a group of colleagues in a psychology group, and they all propose some crazy ridiculous ideas. These are ideas for experiments, and one of them is to find a guy who fell asleep and put a gun in his hand, and blood on him, and all kinds of other crazy stuff and watch his reaction when he wakes up. That idea is funny, and we could have used a lot more ideas like it. Especially since violet works for a psychology studies group. Instead, they completely screw up the idea of doing science experiments to test people’s reactions and behavior. For one thing, they actually do show us this experiment involving the guy who fell asleep, and it turns out to not even be half as funny as it sounded. Some things are better left to the imagination. Another one, that they keep showing repeatedly, as if it were meant to be incredibly funny, involves doughnuts. The experiment is that you get a room full of people and put out a box of doughnuts that has been sitting out for a day. You tell the people that a new box of fresh doughnuts will be arriving in an hour, and you watch to see if they can resist the old ones and wait for the new ones. I get that this is a take on the famous experiment where a kid is promised that if he doesn’t eat the candy in front of him, then he will get two candies instead of just one. The problem is, it is not very funny. In addition, it certainly is not very creative. The only thing good that comes out of the doughnut experiment is a rant that tom goes on about what the doughnuts mean and how violet is lying to people. He is angry with her for other things, and he finally tells her what he really thinks of her experiment. His brutally honest outburst might only be a quick moment, but it is still a lot of fun. If only there was more of this in the film. The big problem with the movie is that it hits every cliché and does not really have much of a story otherwise. It is bad enough that most of the movie is not funny, but to not have an interesting story or anything new to offer, just makes matters worse. I am surprised that this movie was made. Jason Segal and Nicholas Stoller really seemed to be onto something with forgetting Sarah marshal and then Get Him To The Greek. Both of those movies were fresh and creative. I guess with this one, they wanted to try making a routine romantic dramedy (half comedy – half drama). They got exactly what they were asking for, and it is just as lousy as the usual movie in this genre.